In the 1990s, Cuba shifted the methodology of compiling its national account statistics from the Material Product System (MPS), used by centrally planned economies (CPEs), to the System of National Accounts (SNA) used by market economies. While there are some questions about how robustly Cuban statistical agencies currently are applying the SNA methodology,2 unquestionably the shift to SNA has removed a major ill that afflicted revolutionary Cuba’s national accounts statistics for nearly three decades, namely the lack of international comparability. This paper surveys efforts by researchers and organizations to make estimates of Cuban economic performance compatible with those of market economies during the time period—roughly 1960–1990— when Cuban authorities relied on the MPS methodology. The first part of the paper describes the two national accounting methodologies and principal differences. The second part discusses alternative approaches developed by experts to make gross domestic product (GDP)/gross national product (GNP)3 or GDP/GNP growth rate estimates for CPEs. The third part describes estimates of Cuban GDP/GNP or GDP/GNP growth rates, while the fourth part summarizes the results. The paper touches on some of the challenges in international comparisons of economic performance measures related to conversion to a common currency. Nevertheless, the topic of the appropriate exchange rate to use to convert aggregate economic measures of CPEs is a topic worthy of its own analysis and is not addressed in detail here. The Material Product System (MPS) is the system of national accounts used in the former Soviet Union and other CPEs.6 The MPS uses a different concept of national income than does the SNA—the focus in the MPS is on measuring value added in the production of materials goods and in the provision of the limited group of services directly related to the production or distribution of those goods, generally referred to as “productive services.” Sectors of the economy engaged in material production are industry (manufacture and mining), agriculture, and construction; services associated with material production (i.e., productive services) are freight transportation, communications, and wholesale and retail trade. Material production and support services make up what is called the “productive sphere.”7 Aggregate measures of economic activity under the MPS, such as the gross material product (GMP), the net material product (NMP) or the global social product (GSP), refer exclusively to production by the productive sphere and therefore exclude the contribution to national income of the so-called “non-productive sphere,” which is made up of public and private services such as education, health, social insurance pensions and social assistance, culture, housing, passenger transportation, government administration and defense. Conceptually, national income statistics of CPEs (compiled under the MPS) and of market economies (compiled under the SNA) could be made comparable if full information on the component accounts were available. The Statistical Office of the United Nations has analyzed the two approaches and developed a methodology for converting national income data from one system to the other.10 In practice, however, MPS/SNA conversions are generally not feasible because the detailed data for CPEs required to estimate GDP or GNP are not available, and Cuba is no exception. As a result, other approaches have been developed for estimating levels of economic activity and growth rates of centrally planned economies that approximate GDP or GNP. Estimating GNP in dollars for the CPEs directly through the physical indicators approach. The team of experts evaluated the feasibility of using each of the approaches to estimate GNP for eight CPEs in 1980. For six of the CPEs (Czechoslovakia, the German Democratic Republic, Hungary, Poland, Romania, and the Soviet Union), scaling up from NMP to GNP was the best practical method identified, while in the case of another (Bulgaria), the best practical method was to estimate GNP by summing up the end uses of all goods and services produced. Neither of these two methods could be used to estimate Cuban GNP for 1980, however, as is discussed below. For purposes of converting GNP in local currencies to a common denominator (i.e., U.S. dollars), the consensus of the project participants was that purchasing power parity (PPP) exchange rates were preferred over other alternatives. Several researchers and organizations have applied the approaches listed above—or some variation thereof—to estimate Cuban GDP/GNP or growth rates. This section of the paper describes the general approaches and the results of their application to Cuba. As will be discussed in the next section, it is difficult to compare the estimates as they differ with respect to base year, whether the weighting schemes are based on current prices or are adjusted for inflation, whether the estimates are in domestic currency or in dollars, and the exchange rates that might have been used to calculate GDP/GNP in dollar terms. As discussed earlier, scaling up from NMP was the best practical method identified by the team of experts assembled by the World Bank to estimate GNP for CPEs. Figure 1 presents the relationship among macroeconomic aggregates in Cuba’s application of the MPS. 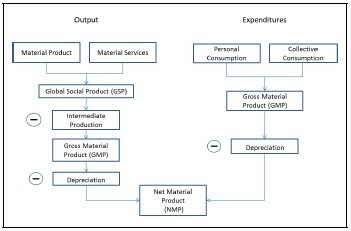 The left branch of the figure considers the components of NMP from the product side, while the right branch does the same from the expenditures side. Recall that the focus of the MPS is on measuring value added in the production of material goods and in the provision of a limited group of services directly related to the production and distribution of material goods. From the production or output side (left branch of Figure 1), sectors of the economy contributing to the Material Product are agriculture, fishing, industry (manufacturing, mining, electricity production) and construction. Material Services, associated with material production, are freight transportation, communications, and wholesale and retail trade. Material production and supportive material services sectors make up the productive sphere; the Global Social Product (GSP) is the indicator of activity in the productive sphere. Subtracting intermediate consumption from GSP yields the Gross Material Product (GMP) and further subtracting Depreciation obtains Net Material Product (NMP). From the expenditures side (right branch of Figure 1), the Gross Material Product (GMP) is the sum of Personal Consumption—which refers to expenditures by household units on goods and material services, such as purchases of goods sold in state retail stores and agricultural markets, restaurant purchases, fees paid for public utilities, use of public transport, cost of home repair, and consumption of meals at state workplaces—and Collective Consuption, also called social consumption—which refers to consumption by institutions that satisfy collective needs. Subtracting Depreciation from GMP yields NMP. Scaling up to the familiar SNA aggregates GNP or GDP would require adding to NMP the contribution to national income of the so-called non-productive sphere, which is made up of private and public services such as education, health, social insurance pensions and social assistance, culture, housing, passenger transportation, government administration, and defense. 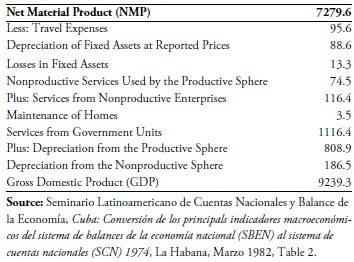 Mesa-Lago and Pérez-López15 evaluated the possibility of scaling up from NMP to estimate Cuban GDP for 1980 and found that it was not feasible because of the lack of data. They observed that NMP statistics were not available and neither were consistent GMP statistics. (Beginning in the late 1960s, the only national income indicator regularly published by Cuba was GSP, which includes intermediate consumption.) Moreover, Cuba has not regularly published data on the value of NMS or on the value of individual nonmaterial services that could be aggregated to estimate the value of NMS. 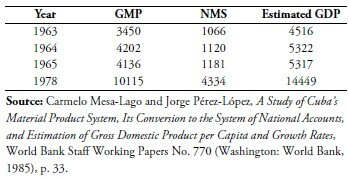 For several years for which official GMP data were available, Mesa-Lago and Pérez-López made rough estimates of the value of Cuban NMS using as proxies expenditures on these sectors from the national budget and scaled up to estimate GDP in pesos. The estimates are given in Table 1. The value of nonmaterial services estimated by Mesa-Lago and Pérez- López ranged from 21.0% to 23.6% of the estimated value of GDP for 1963–1965, while for 1978 it was about 30.0%. For the year 1974 only, researchers at Cuba’s Comité Estatal de Estadísticas (CEE), the government’s statistical office, carried out an exercise of scaling up to GDP from NMP for a seminar on Latin American national income accounts held in 1982. Summary results are given in Table 2. Cuban statisticians reported NMP in 1974 at 7279.6 million pesos. They adjusted NMP by subtracting certain categories of services, losses, and depreciation and adding value added in the nonproductive sphere plus depreciation to obtain GDP. The reported value of GDP in 1974 was 9239.3 million pesos. Note that the estimate of the value of nonmaterial services in 1974 by CEE of 1236 million pesos (13.3% of GNP) is not out of line with the 850 million pesos (10.3% of GNP) estimated by the CIA. In the midst of an effort by the Cuban Government to renegotiate with lenders the terms of its foreign debt, in mid-1982 the BNC issued a report in which it presented estimates of GDP in current pesos purportedly calculated using the SNA.17 The series of estimates for 1971–1980 in the BNC report are given in Table 3. Although said report does not indicate the specific methodology used to make the GDP estimates, a fair assumption is that they were based on the scaling up exercise conducted by CEE (for 1974) mentioned above for two reasons: (1) the CEE exercise and the BNC report were contemporaneous; and (2) the estimated GDP value for 1974 in the CEE exercise (9239 million pesos) and in the BNC report (9240 million pesos) were almost identical. Bergson pioneered a methodology for estimating GDP/GNP growth rates for CPEs that relied on combining changes in non-monetary measures of activity for a large number of economic categories using information on factor cost prices and on value added. 18 This approach, sometimes called the “bottom- up” approach, requires: (1) compiling output or activity indexes for a fairly large number of individual products or services; (2) aggregating the output or activity indexes into branch/sector indexes using a set of base year weights (typically factor cost prices) that reflect the relative importance of each product or service within branches or sectors of the economy; and (3) combining the branch/sector indexes into an overall index of national economic production using base year weights (typically value-added weights) that reflect the contribution of each branch/sector to GDP/GNP. Separately, Brundenius also made estimates of GDP for the period 1965–1981 (Table 4) that appear to be based at least in part on the bottom up approach. Brundenius states that he used indicators of physical production for a large number of consumer goods and that he aggregated them using official Cuban retail prices for 1965 to obtain activity indexes for the principal goods-producing sectors and for the material product. It is not clear how he aggregated physical production series for capital goods and intermediate products sectors, for which prices were not available; he seems to have used official data on the gross value of output for these sectors. Finally, it appears that he estimated the value of non-material services using as a proxy expenditures on social services in 1965, projecting the latter forward and backward applying the rates of growth of the education and public health sectors. 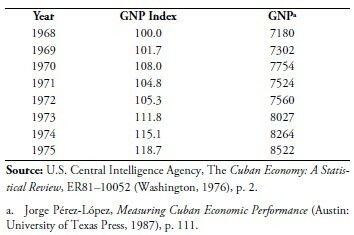 In another publication,22 the CIA calculated a series of index numbers of Cuban GNP growth in pesos for 1968–1975 using the “bottom-up” approach: (1) for goods-producing sectors (agriculture, industry, sugar production), the CIA constructed physical output indexes using production data for key commodities. Official Cuban production data were used in most cases; however, for some agricultural commodities for which official data exclude private sector production, reported acopio (government procurement) data were adjusted upward by 10–15%. Individual physical output indices were aggregated to produce sectorial indexes using retail prices for 1957; (2) for productive services sectors (construction, transportation, communications), output indexes were developed based on the behavior of key variables such as apparent consumption of construction materials and freight and passenger traffic, based on official data); (3) the indexes for each sector were aggregated using as weights the contribution of each sector to GNP in 1957. Pérez-López has also constructed estimated growth rates of Cuban GDP for the period 1965–82 using the “bottom-up” approach, that is, from changes in non-monetary measures of activity in a large number of economic categories aggregated using factor cost prices and value added information.24 He used approximately 270 non-monetary activity series in the calculations: 185 individual products from the industrial sector, 43 products from the agricultural sector, and 23 and 18 activity series, respectively, for productive services sectors and nonproductive services sectors. As prices of goods and services in socialist Cuba are fixed by the government and deemed not to reflect factor costs, proxy prices from other market economies for 1973–1974 were used to aggregate individual products and services into branches and sectors of the economy. Finally, aggregation across branches and sectors was carried out using value-added weights. The Food and Agriculture Organization (FAO) of the United Nations used a variant of the “bottom up” approach to estimate the value of agricultural production of a large number of member states— among them Cuba—for 1970, 1975 and 1980.26 For each country in the study, FAO statisticians estimated the value of agricultural production on the basis of physical output of each commodity priced at a common “international price.” For Cuba, the FAO estimated the value of agricultural output at 1248 million international dollars in 1970, 1709 million international dollars in 1975, and 2739 million international dollars in 1980. Roy extrapolated from the FAO agricultural production estimates to estimate GDP in Cuba (also in North Korea and Vietnam) on the basis of the relationship between the value of agricultural output and GDP in analogue countries for which both statistics were known.27 Roy used Costa Rica as the analogue for Cuba. Thus, for Costa Rica, agricultural output in 1980 was $780 million and GDP was $7,128 million; therefore, for Cuba, with an estimated agricultural output of $2,739 million, the corresponding GDP level in 1980 would have been $25,030 million or $3,083 per capita.28 It should be noted that Roy himself acknowledges that this methodology is crude and at best yields tentative estimates of the size of economies. The physical indicators (PI) approach, developed by Janossy and Ehrlich,29 has been used extensively to estimate GDP/capita for CPEs. In addition to producing measures of GDP/capita for countries that relied on the MPS, the PI approach has the advantage of obviating the problem associated with exchange rate conversion, as estimates are directly produced in a convertible currency (typically dollars). The conceptual basis for the PI approach is the empirically- observable relationship between levels of physical (that is, nonmonetary) indicators of consumption or production and overall levels of economic output, consumption, or income, both between countries and over time. The method posits that the observed relationship between the level of one or more physical indicators (for example, energy consumption per capita) and the level of economic activity for an economy (for example, GDP/capita) at time t approximates the relationship between these same variables in other economies also at time t. Assuming that the relationships are stable across countries with different economic systems, the estimated relationship between the level of one or more physical indicators and GDP/capita for a group of reference countries for which both measures are available (for example, countries using the SNA) can be used to estimate GDP/capita for a target country that does not publish such a measure but that does publish data on physical indicators (for example, a country that uses the MPS). If the relationship is estimated for a group of reference countries using GDP/capita in dollars as the dependent variable, then estimates of GDP/capita in dollars can be made for the target country. Mesa-Lago and Pérez-López estimated Cuban GDP/ capita in dollars for 1965, 1970, 1975 and 1977 using the PI approach.30 They used as reference 28 countries the authors believed were representative of the structure and level of development of the Cuban economy in the 1960s and 1970s. Because of data limitations, they were forced to rely on a set of 24 physical indicators (rather than the 30 or more used by researchers in other country applications); moreover, the set of indicators they used had relatively few measures of consumption (compared to production) and measures for certain activities were missing altogether (e.g., consumption of housing services). In one experiment, the authors took a simple average of the estimated level of Cuban GDP/capita in dollars obtained from each of the 24 univariate regressions; in a second experiment they used multivariate regression, a method in which variables with the most explanatory power are implicitly selected and to some extent the problem of weighting of individual estimates to compute an overall average are mooted.31 Two sets of estimates of Cuban GDP/capita in dollars—from the univariate and from the multivariate experiment—as well as the implied growth rates are presented in Table 7. It is worth noting that the estimates from the two PI approaches are within 3% of each other except for 1975. Joglekar and Zimbalist also experimented with the PI approach to estimate Cuban GDP/capita in dollars; in addition to replicating the more traditional univariate application of the PI approach, they have also experimented with factor analysis to obviate the weighting/aggregation problem.32 In their first set of experiments, they estimated Cuban GDP/capita in 1980 using the same reference countries used by Mesa-Lago/Pérez-López and a very similar set of physical indicators (they dropped one indicators because of data problems and added five others). The dependent variable in the experiments was GDP/capita of the reference countries at 1980 prices converted to dollars at (1) market exchange rates; and (2) purchasing power parity exchange rates. Based on market exchange rates, Joglekar and Zimbalist estimated Cuban GDP/capita in 1980 at $2325 and based on purchasing power parity exchange rates at $3385. In the second experiment, using principal components/ factor analysis, the estimated Cuban GDP/capita for 1980 using market exchange rates was $2691 and when using purchasing power parity exchange rates it was $3483. The previous sections have documented efforts by researchers and organizations to make estimates of Cuban GDP/GNP or of growth rates during the time period when Cuban national accounts were compiled under the MPS. As is clear from the discussion, the efforts have been episodic, with no researcher or organization producing estimates using the same methodology for a prolonged period of time. It is also evident from the previous sections that the estimates that have been made are based on different methodologies/approaches and that the estimates themselves are not comparable as in some instances they refer to (1) GDP/GNP aggregates in local currency (pesos) either at current prices or at constant prices; (2) GNP/GDP growth rates in local currency either at current or at constant prices; or (3) GDP/ GNP aggregates in dollars calculated on the basis of market exchange rates or PPP exchange rates. With those caveats in mind, in what follows we group together estimates of GDP/GNP or growth rates made by different individuals or organizations that ostensibly refer to the same aggregate as a way to cross check the reasonableness of the estimates and of the approaches on which they were based. 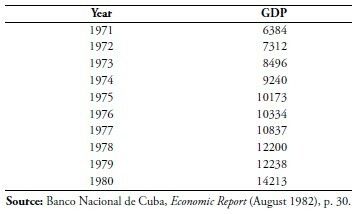 Under this rubric we group the estimates of Cuban GDP for 1963–1965 and 1978 calculated by Mesa- Lago and Pérez-López using the scaling up methodology (Table 1) as well as the estimate for 1974 by the Comité Estatal de Estadísticas resulting from a full conversion from MPS to SNA conducted by that government agency (Table 2), the BNC series for 1971–1980 (Table 3), and estimate for 1974 by the CIA. A scatter plot of these estimates is given in Figure 2. While the estimates generally line up along a rising trend over time, the sparseness of the data does not permit drawing any inferences. The growth rate estimates in this grouping correspond to those made using the “bottom up” methodology by Brundenius (Table 4), the CIA (Table 5), and Pérez-López (Table 6). Because they are based on a vector of prices for a single year, these indexes are estimates of GDP growth at constant prices of the price base year: 1965 for Brundenius’ estimates and 1973–1974 for Pérez-López’s, both years within the estimation interval, and 1957 for the CIA’s, outside of the estimation interval. The three growth rate index series, rebased to 1974=100 to facilitate comparison, are shown in Figure 3. The two longest growth index series—by Brundenius and Pérez-López—tend to track each other quite closely over the time span for which they are both available. Beginning in 1975, however, Brundenius’ index series shows a steeper growth rate than the one calculated by Pérez-López. The behavior of the CIA index series is roughly similar to that of the other two for the period for which it is available. The PI method yields GDP/GNP estimates in dollars (or in whatever currency the GDP/GNP values for the reference countries are specified). Researchers and organizations that have used this methodology typically used GDP/GNP per capita as the dependent variable, and the applications for Cuba have done the same. Figure 4 shows a scatter plot of the GDP/capita in dollars estimates for 1965, 1970, 1975 and 1977 made by Mesa-Lago and Pérez-López and those for 1980 made by Joglekar and Zimbalist. The figure shows two sets of estimates by Mesa-Lago and Pérez-López, the first (ML-PL I) being the results of applying the univariate approach and the second (ML-PL II) the results of applying the multivariate approach. With regard to the estimates by Joglekar and Zimbalist, in addition to an estimate for which GDP per capita of the reference countries was converted from local currency to dollars using market exchange rates (labeled as JZ in Figure 4), a second estimate for which the conversion of local currency to dollars was made using purchasing power exchange rates (labeled JZ PPP) is also included. The sparseness of the data does not permit drawing any inferences. This paper has surveyed efforts by researchers and organizations to make estimates of Cuban economic performance compatible with those of market economies during the time period—roughly 1960– 1990—when Cuban authorities relied on the MPS methodology. Several approaches have been used— scaling up, bottom up, physical indicators—that have yielded several estimates of GDP/GNP in domestic currency (pesos), rates of growth of GNP/ GDP, and estimates of GDNP/GDP in dollars. The estimating efforts have been episodic and the sparseness of estimates does not permit a thorough evaluation of the different methodologies and the quality of the estimates. 1. I am grateful to John Deveraux and Carmelo Mesa-Lago for comments and suggestions on an earlier version of this paper. 2. See, e.g., Jorge Pérez-López and Carmelo Mesa-Lago, “Cuban GDP Statistics Under the Special Period: Discontinuities, Obfuscation, and Puzzles,” Cuba in Transition—Volume 19 (Washington: Association for the Study of the Cuban Economy, 2009) and sources cited therein. 3. GDP is the value of goods and services produced within the borders of a country, regardless of the nationality of those who produce them, while GNP is the value of goods and services produced by the residents of a country, even if they are living abroad. The two measures tend to be very close to each other and are used interchangeably in this paper. 4. http://unstats.un.org/unsd/sna1993/introduction.asp. The rest of this paragraph relies heavily on this same source. The basic document on the SNA is United Nations, Statistical Office, A System of National Accounts (New York: United Nations, 1968). 5. The most thorough examination of the problems associated with SNA measures and the challenges of developing alternative measures is contained in the report prepared by the Commission on the Measurement of Economic Development and Social Progress, established by France’s President Sarkozy in 2008, with the objective of analyzing the adequacy of current measures of economic performance and how measures of development could take better account of societal wellbeing. The Commission was chaired by prominent economist Joseph Stiglitz; Amartya Sen, another prominent economist, served as principal advisor. The Commission’s report, issued in 2009, is available at http://www.stiglitz-sen-fitoussi.fr/documents/rapport_anglais.pdf. 6. United Nations, Statistical Office, Basic Principles of the System of Balances of the National Economy (New York: United Nations, 1971). With the exception of North Korea, no country is believed to use the MPS currently. 7. For a description of the MPS see, e.g., Central Intelligence Agency, National Foreign Assessment Center, USSR: Toward a Reconciliation of Marxist and Western Concepts of National Income (Washington, 1978). 8. During this period, the Cuban peso was valued at par with the U.S. dollar, and therefore GNP and other aggregates reported in pesos are also in U.S. dollar terms. The parity of the peso with the U.S. dollar ended around 1960. 9. The classical review and analysis of socialist Cuba’s early statistics is Carmelo Mesa-Lago, “Availability and Reliability of Statistics in Socialist Cuba,” Latin American Research Review, Pt. 1, 4 (Winter 1969) and Pt. 2, 4 (Summer 1969). See also Mesa-Lago, Market, Socialist and Mixed Economies: Comparative Policy and Peformance—Chile, Cuba and Costa Rica (Baltimore: Johns Hopkins University Press, 2000). This section draws on Mesa-Lago’s work. An interesting historical essay on Cuban national accounts is Antonio Santamaría García, “Las cuentas nacionales de Cuba, 1890–2005,” Red de Estudios Comparados del Caribe y el Mundo Atlántico (mayo 2005), http://reccma.es/santamaria.pdf. 10. United Nations, Statistical Office, Comparison of the System of National Accounts and the System of Balances of the National Economy, Part I: Conceptual Relationships and Part II: Conversion of Aggregates of SNA to MPS and Viceversa for Selected Countries (New York: United Nations, 1981). 11. Carmelo Mesa-Lago and Jorge Pérez-López, A Study of Cuba’s Material Product System, Its Conversion to the System of National Accounts, and Estimation of Gross Domestic Product per Capita and Growth Rates, World Bank Staff Working Papers No. 770 (Washington: World Bank, 1985). 12. Paul Marer, Dollar GNPs of the U.S.S.R. and Eastern Europe (Baltimore: The Johns Hopkins University Press for the World Bank, 1985) and Marer, “Alternative Estimates of the Dollar GNP and Growth Rates of the CMEA Countries,” in Joint Economic Committee, East European Economies: Slow Growth in the 1980s (Washington: U.S. Government Printing Office, 1985). See also, Paul Marer, Janos Arvay, John O’Connor, Martin Schrenk, and Daniel Swanson, Historically Planned Economies: A Guide to the Data (Washington: World Bank, 1992). 13. Marer, Dollar GNPs, p. 15. 14. Marer, Dollar GNPs, p. 15, also described a variation of the “scaling up” method, namely scaling up from NMP to GNP on the basis of the average regression relationship between NMP and GNP for a group of Western countries in a benchmark year. Marer deemed this method to be devoid of a theoretical basis and dismissed it. 15. Mesa-Lago and Pérez-López, A Study of Cuba’s Material Product System. On the application of the MPS in Cuba and challenges in converting to SNA, see also Andrew Zimbalist and Claes Brundenius, The Cuban Economy: Measurement and Analysis of Socialist Performance (Baltimore: The Johns Hopkins University Press, 1989), particularly pp. 9–13. Table 1. Estimates of Cuban GDP Using Scaling Up Procedure (million pesos) Year GMP NMS Estimated GDP 1963 3450 1066 4516 1964 4202 1120 5322 1965 4136 1181 5317 1978 10115 4334 14449 Source: Carmelo Mesa-Lago and Jorge Pérez-López, A Study of Cuba’s Material Product System, Its Conversion to the System of National Accounts, and Estimation of Gross Domestic Product per Capita and Growth Rates, World Bank Staff Working Papers No. 770 (Washington: World Bank, 1985), p. 33. 16. U.S. Central Intelligence Agency, The Cuban Economy: A Statistical Review, ER81–10052 (Washington: July 1976). 17. Banco Nacional de Cuba, Economic Report (August 1982), p. 30. A footnote to the table containing the estimates states: “In terms of the UN-National Accounts System.” Table 3. Scaling Up Estimates of Cuban GDP by BNC (in current pesos) Year GDP 1971 6384 1972 7312 1973 8496 1974 9240 1975 10173 1976 10334 1977 10837 1978 12200 1979 12238 1980 14213 Source: Banco Nacional de Cuba, Economic Report (August 1982), p. 30. 18. Abram Bergson, “Soviet National Income and Production in 1937,” Quarterly Journal of Economics, Pt. 1, 65 (May 1950) and Pt. 2, 65 (August 1950). For application to other countries see, e.g., John K. Chang, Industrial Development in Pre-Communist China (Chicago: Aldine, 1969); Pong Lee and John M. Montias, “Indices of Romanian Industrial Production,” in John M. Montias, editor, Economic Development in Communist Rumania (Cambridge: MIT Press, 1967); and George J. Staller, “Czechoslovak Industrial Growth, 1948–1959,” American Economic Review, 52 (June 1962). 19. Jorge Pérez-López, “An Index of Cuban Industrial Output, 1930–58,” in James W. Wilkie and Kenneth Ruddle, Quantitative Latin American Studies: Methods and Findings (Los Angeles: UCLA Latin American Center, 1977). 20. Claes Brundenius, Economic Growth, Basic Needs and Income Distribution in Revolutionary Cuba (Lund, Sweden: Research Policy Institute, University of Lund, 1981). A slightly revised version is Brundenius, Revolutionary Cuba: The Challenge of Growth with Equity (Boulder, Colorado: Westview, 1984). Interestingly, the growth rates of TMP that he calculates are 4.3% in 1959, 1.5% in 1960, and 2.8% in 1961, compared to industrial production growth rates of 17% in 1959 and 25% to 29% in 1960 reported by economists favorable toward the Cuban revolutionary process and 13% in 1960 and 6.2% in 1961 given in an official government publication. See Brudenius, Economic Growth, p. 42. 21. U.S. Central Intelligence Agency, Cuba Foreign Trade, A(ER)75–69 (Washington: July 1978), p. 17. 22. U.S. Central Intelligence Agency, The Cuban Economy. 23. 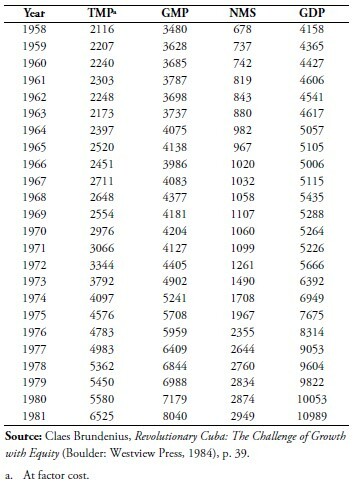 The CIA estimates of GNP growth rates and of GNP apparently have been used by other U.S. agencies as well. See, for example, the estimates of Cuban GDP in dollars at current and constant prices in several issues for the 1970s of the U.S. Arms Control and Disarmament Agency, World Military Expenditures and Arms Transfers (Washington, various years). Table 5. Growth Rate of Cuban GNP and GNP Estimates, 1968–1975, by CIA (1968=100 and million pesos at current prices) Year GNP Index GNPa 1968 100.0 7180 1969 101.7 7302 1970 108.0 7754 1971 104.8 7524 1972 105.3 7560 1973 111.8 8027 1974 115.1 8264 1975 118.7 8522 Source: U.S. Central Intelligence Agency, The Cuban Economy: A Statistical Review, ER81–10052 (Washington, 1976), p. 2. a. Jorge Pérez-López, Measuring Cuban Economic Performance (Austin: University of Texas Press, 1987), p. 111. 24. Jorge Pérez-López, Measuring Cuban Economic Performance (Austin: University of Texas Press, 1987). Table 6. 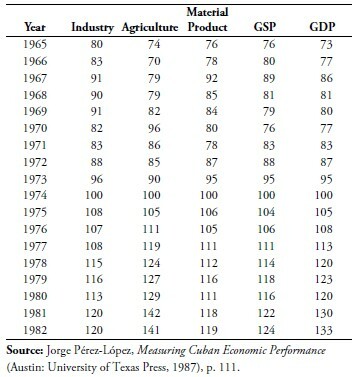 Estimated Output Indicators for Cuba, 1965–1982 (1974=100) Year Industry Agriculture Material Product GSP GDP 1965 80 74 76 76 73 1966 83 70 78 80 77 1967 91 79 92 89 86 1968 90 79 85 81 81 1969 91 82 84 79 80 1970 82 96 80 76 77 1971 83 86 78 83 83 1972 88 85 87 88 87 1973 96 90 95 95 95 1974 100 100 100 100 100 1975 108 105 106 104 105 1976 107 111 105 106 108 1977 108 119 111 111 113 1978 115 124 112 114 120 1979 116 127 116 118 123 1980 113 129 111 116 120 1981 120 142 118 122 130 1982 120 141 119 124 133 Source: Jorge Pérez-López, Measuring Cuban Economic Performance (Austin: University of Texas Press, 1987), p. 111. 25. Pérez-López’s growth rate estimates are used by Angus Maddison in his compendium of historical economic statistics for estimating Cuban GDP for the relevant period, See Angus Maddison, The World Economy: Historical Statistics (Paris: Development Centre, Organization for Economic Cooperation and Development, 2003). 26. Food and Agriculture Organization of the United Nations, Inter-country comparisons of agricultural production aggregates, FAO Economic and Social Development Paper 61 (Rome: FAO, 1986). 27. Donald J. Roy, “Real Product and Income in China, Cuba, North Korea and Vietnam,” Development Policy Review, 8 (1990). 28. Expanding on Roy’s work, and using historical statistics on Costa Rican GDP from the World Bank Economic Indicators Data Base, Cuban GDP can be estimated at $21,812 million in 1970, $18,986 million in 1975, and $26,741 million in 1980. The reference statistics for Costa Rica are: value of agricultural output (from FAO, Inter-country comparisons …), 247 million international dollars in 1970, 521 million international dollars in 1975, and 780 million international dollars in 1980; GDP (from World Bank Economic Indicators Data Base), $4,317 million in 1970, $5,788 million in 1975, and $7,473 million in 1980. 29. Eva Ehrlich, “An Examination of the Inter-relation between Consumption Indicators Expressed in Physical Units and Per Capita National Income,” Czechoslovak Economic Papers, 7 (1966). 30. 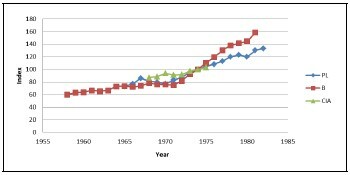 Carmelo Mesa-Lago and Jorge Pérez-López, “Estimating Cuban Gross Domestic Product Per Capita in Dollars Using Physical Indicators,” Social Indicators Research, 16 (1985). 31. For an explanation of the methodology see W. Beckerman and R. Bacon, “International Comparisons of Income Levels: A Suggested New Measure,” Economic Journal, 76 (September 1966). Table 7. Estimates of Cuban GDP/Capita in Dollars Using PI Approach Year Univariate PI Multivariate PI Dollars Growth rate Dollars Growth Rate 1965 480 NA 494 NA 1970 616 5.9% 635 5.2% 1975 1127 12.1% 1006 9.6% 1977 1355 9.6% 1317 14.4% Source: Carmelo Mesa-Lago and Jorge Pérez-López, “Estimating Cuban Gross Domestic Product per Capita in Dollars Using Physical Indicators,” Social Indicators Research, 16 (1985), pp. 291–295. 32. Gitanjali Joglekar and Andrew Zimbalist, “Dollar GDP per Capita in Cuba: Estimates and Observations on the Use of the Physical Indicators Method,” Journal of Comparative Economics, 13 (1989). See also Chapter 5 in Zimbalist and Brundenius, The Cuban Economy: Measurement and Analysis of Socialist Performance. 33. Nicolás Sánchez and Miles Cahill, “The Strenghts and Weaknesses of Factor Analysis in Predicting Cuban GDP,” Cuba in Transition—Volume 18 (Washington: Association for the Study of the Cuban Economy, 1998). 34. Sánchez and Cahill, pp. 281 ff., argue that factor analysis based on the characteristics of market economies, cannot properly estimate the GDP/capita of a command economy such as Cuba for a number of reasons, principally because the proportion of public goods to private goods and the relationship between demographic characteristics and GDP differ significantly between market and command economies and some issues regarding whether GDP/capita in a command economy reflect the true level of economic welfare. For additional concerns about the use of factor analysis as a tool to predict Cuban GDP/capita see Roger Betancourt, “Comments on ‘The Strengths and Weaknesses of Factor Analysis in Predicting Cuba’s GDP,” by Nicolás Sánchez and Miles Cahill,” Cuba in Transition— Volume 18 (Washington: Association for the Study of the Cuban Economy, 1998).